It was a long time of not posting "philosophical" and introspective aspects concerning the Dow Theory. While it may seem evident to many, this post is the result of some nights of serious introspection. I wanted to completely isolate the factors (variables) that account for the Dow Theory outperformance versus buy and hold (BAH). This is important because the “stress-test” while resting on “past performance” is also forward looking, and hence we have to imagine previously unseen scenarios. To do this, we need to know what drives outperformance, and, conversely, underperformance. First of all, in order to compare “apples” to “apples”, we need to define how we are going to measure performance for both BAH and the Dow Theory. For BAH, we should take as our starting point a primary bear market bottom. Starting from this value, we add the total percentage gain from the swing that goes from bottom to top. Once we have the resulting gain, we reduce it by multiplying it by the percentage loss of the next downward swing from primary bull market top to next primary bear market bottom. Primary bear market bottom at 100 points level. Upward swing until top of 35%. Hence 100 x 1.35 = 135 points. Downward swing until next primary bear market bottom -20%. Hence 135 x 0.8 = 108 points. Total advance for BAH after one complete bull/bear market swing has been completed = 108/100 = 8%. Hence, 8% would be the performance for BAH after a full movement (upward and downward swing is completed). For the Dow Theory things are slightly different. Since the Dow Theory, unlike BAH is not all the time invested, it is not possible to catch the exact primary bear market low as an entry point. Let’s assume that the entry (primary bull market signal) was signaled at 7.5% above the bottom. Hence, our entry point would be at 100 x 1.075 = 107.5 points. Here we have won nothing. Just hopped into the car. We know that the upward swing from bottom (100) to top (135) amounted to 35%. Thus, having entered at 107.5 our top would be at 135. Let’s now imagine that our exit (primary bear market signal) is at 7% from the top of the primary bull market. 135 x 0.93= 125.55 points. Here you have one chart. The orange arrow (connecting the starting primary bear market with the next one) shows the performance made by BAH. 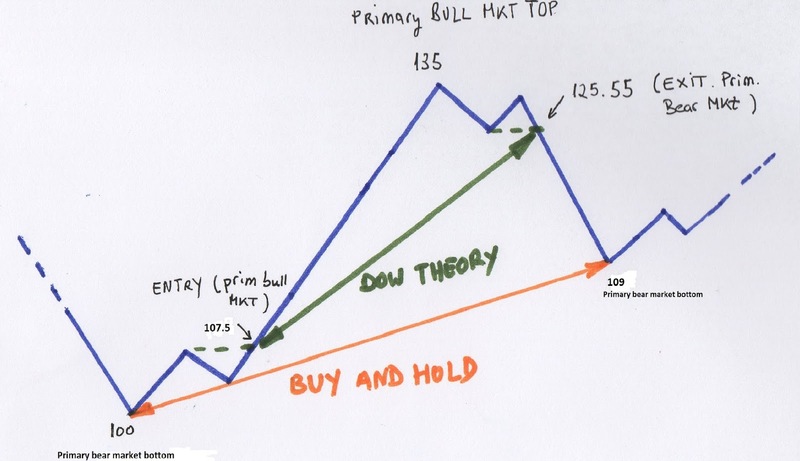 The green arrow connects the entry and exit points at determined by the Dow Theory. While my chart is not state of the art, please examine it carefully. First you will see a common error made by many buy and holders. To estimate how well BAH is faring, you need to measure from bottom to bottom (or alternatively from top to top). What you cannot do is to measure performance from bottom to top, and ignore the ensuing decline which eats up unrealized profits. From time to time I get comments, which deride the Dow Theory because it “missed”, i.e., 15% from a given swing (swing meaning total advance from primary bear market low to primary bull market high). However, such detractors omit to factor in the subsequent down swing (from top to next primary bear market bottom). If performance is going to be evaluated for a period extending more than one buy/sell pair (round trade), then to keep comparing apples to apples, we need to start with a primary bear market low and finish with another one. What you cannot do is to start with the bottom and whimsically finish at a top. Let’s formulate outperformance in reverse. What is detrimental to buy and hold? Answer: The downward swing. In other words, BAH depends on just two variables. On the one hand, the larger the upward swing, the more performance that builds up. On the other hand, the downward swing which reduces the unrealized profits. The larger the downward swing the lower total performance. Thus, BAH's only enemy is the downward swing. It is not the same to add 20% at a level of 100, which results in 120, than reducing 120 by 20% which results in 96. Furthermore, to just break even, a recovery from 96 (to reach 120 again) requires a 25% upward movement. Thus, the power of compounding and the asymmetry between top and bottoms is clearly detrimental to BAH. A drawdown of -50% (a common occurrence every 10-20 years) needs a 100% advance just to break even. You may begin to glance that the Dow Theory is better protected from the destructive power of compounding when it works in reverse. If there is a downswing of -20%, we, Dow Theorists, might just take a hit of -10% because we exited before the bottom was made. Please mind that a -10% “hit” just takes +11% to recover, which is easier that getting a +25% after a hit of -20% to break even. Thus, the deeper the downward swing, the more BAH will be hurt, and, conversely the more the Dow Theory will likely outperform. Thus, we can isolate the only variable driving the Dow Theory outperformance: The deeper the further decline following a primary bear market signal, the worst for BAH, and the better for the Dow Theory. This is why it is vital to check whether primary bear market signals (our “sell”) do really have follow through. If there were no further decline following the sell signal, the Dow Theory would be worthless. As simple as that. Yes, it’d be worthless since it would not protect us from drawdowns, and we would always be selling at the worst possible time (just at the bottom, when the rebound is at hand). Therefore, the deeper the subsequent decline following the primary bear market signal, the better for the Dow Theory and the worse for BAH. In the example I gave above (see chart above), the Dow Theory exited 7% from the top at 125.50, whereas BAH had to endure a loss of -20% (exit at 108 price level). The outperformance resulting from exiting at -7% rather than seeing unrealized profits vanish by -20% is eye-popping. All in all: the frequent criticism thrown at the Dow Theory that it never exits at the top is unfounded as BAH gets clobbered by downward swings. As I showed in this post, sell signals have had a follow through of ca. -12.15% (figure updated in January 2019). This is clearly outperformance. However, this is only “raw” outperformance as, unlike BAH which is always invested, the Dow Theory never signals a “buy” at the exact bottom. Thus, the percentage lost from bottom to entry, is detrimental to the Dow Theory. BAH by definition is “in” at the bottom and has more to profit from the new upward swing. Thus, following my example BAH is able to capture the full +35% upswing (from 100 to 135 price level). However, the Dow Theory by entering at 107.5, missed 7.5%. Hence, the percentage lost by the Dow Theory when belatedly entering after a bottom has been made is a source of underperformance versus BAH. 2. The extent of the further decline following the primary bear market signal. The deeper, the better for the Dow Theory, as it implies more decimation for BAH. This is the only source of outperformance versus BAH. Please mind that the extent of the upward swing is immaterial to the Dow Theory’s outperformance. The extent of the upward swing benefits equally buy and hold and the Dow Theory. Of course, the larger, the better. However, if you want to find the roots of outperformance, you have to look at the extent of the further decline following a primary bear market signal (only source of outperformance), and at the percentage lost when entering (only source of underperformance), the smaller, closer to the bottom, the better for the DT). And what about price action between the entry some percentage points above the bottom and the exit some percentage points below the top? It is neutral. It neither contributes nor detracts to performance. When the Dow Theory is invested it is overlapping buy and hold. Hence any movement of the markets (both up and down) benefits (upswing) or harms (downswing) both investment strategies equally. Here you have another coarse chart depicting the situation. It depicts a full cycle (from bottom to bottom). Marked in red is the distance between the entry and the low (source of underperformance). Marked in blue is the distance between the exit and the next bottom (source of outperformance). Marked in green is the distance between the entry and the exit where there is neither outperformance nor underperformance. So keep in mind this vital aspect, as it helps us put into context the performance of the Dow Theory according to different market conditions. While the variable governing underperformance (distance between the entry and the bottom marked in red) is fairly similar in most trades (around 8% on average with specific values which tend to cluster around such an average), the variable concerning outperformance (around -12.15% further decline on average, marked in blue) tends to differ substantially in each specific trade. Thus, there is lots of dispersion around the average, with trades where the subsequent decline is close to zero (i.e. 2011 and 2012) and other trades where the subsequent decline exceeds -40% (i.e. 1973 and 2008). Hence, my obsession with monitoring the subsequent decline following primary bear market signals. It is the only source of outperformance and, to unnerve investors, it is highly variable which results in many trades with almost no source of outperformance (further decline), some trades with a modicum of outperformance (i.e. further decline which should exceed at least the percentage lost when entering) and a few trades with a huge source of outperformance (i.e. more than -30% further decline). No wonder the Dow Theory, in spite of its long term outperformance, tends to underperform buy and hold on any given year. a) On the long run, there have always been big declines and the Dow Theory reasserted its outperformance versus BAH. Furthermore, it is not only a question of making 2,3 or 4% percentage points of outperformance p.a., even though on most years, there will be underperforming. The beauty of the Dow Theory versus BAH lies in the avoidance of huge drawdowns which can devastate the investor both financially and psychologically. More interesting figures and thoughts concerning this aspect, here. Please now cogitate this post, as it sets the stage for future posts where I will further deepen the profile of Dow Theory trades according to market conditions, and, more importantly, I will discern whether inflationary and deflationary conditions are good or detrimental for the Dow Theory versus BAH. I will also analyze whether the Fed action, plunge protection team, etc. has been good or bad for the Dow Theory. Hopefully, I'll find the time to write. The ideas are raging in my mind but putting them on written is quite another thing.